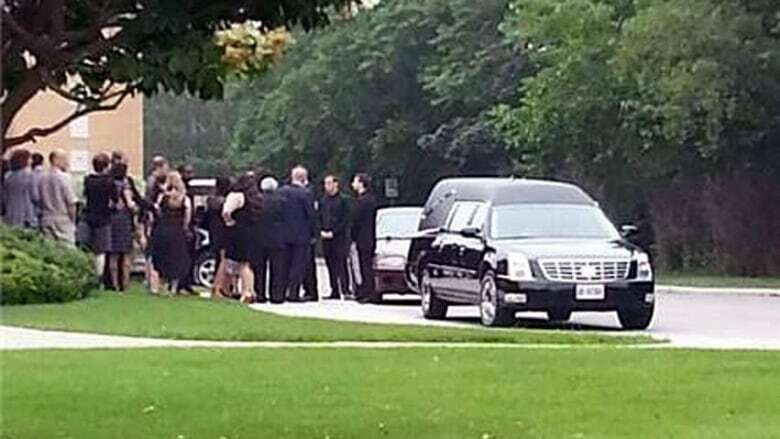 Some shed tears, others held one another while a few just looked shell-shocked as they gathered Wednesday to mourn an Ontario toddler who died last week after being left alone in a sweltering car. The funeral for Maximus Huyskens took place just hours before a three-year-old girl who was left in a hot car in Edmonton died in hospital. The two losses — heart-wrenching in their similarity — reignited the discussion over the dangers of leaving children unattended in vehicles. The service for Max, held at a church west of Toronto, drew family, friends and even some strangers, united in their empathy for parents who had lost their youngest son a month before his second birthday. "The death of Maximus seems so senseless, so wasteful and so inconsistent with all we know," said Rev. Peter Tuyen Nguyen, the priest leading the traditional Catholic mass during which a small white casket lay before the altar. "We come here to share the sorrow with the parents, Marcus and Tamara. To show our support for them in their deep loss." Nguyen described the toddler's death as a "freak accident" and called on those gathered to support Max's parents and his two older siblings. Police have said the boy died after "being exposed to high-level temperatures for an extended period of time" in a sedan outside a Milton, Ont., home. Investigators said the child was in the care of his maternal grandmother, who is in her 50s, while his father was at work and his mother was at an appointment. No charges have been laid and police say they're still awaiting further toxicology test results. Max's parents, who didn't speak at the service where they struggled to contain their emotions, have said their son "shared his magic with everyone he met." "He was a boy who loved to talk about birds in the sky and whales in the water. He was a boy who would always pick a flower for his parents whenever he saw one," they wrote in an obituary notice. As horrifying as the deaths of Max and the Edmonton girl were, safety experts hoped the tales of loss would highlight the problems around leaving children alone in or near vehicles. "If there's any good in it at least it does draw attention to the fact that this is a problem," said Catherine Gaudreau, spokeswoman for the Canada Safety Council. "The bottom line would be to never leave a child alone in a vehicle, not even for a few minutes." While there are no official statistics available, the organization estimates between four to six children across the country die after being left alone in vehicles every year. Hot cars are particularly dangerous for young children, said Gaudreau, explaining that on a summer day the temperature inside a car can soar to 50 degrees Celsius in as little as 10 to 20 minutes. Heatstroke can occur when surrounding temperatures reach about 40 degrees. A child left in a sweltering car could go into shock, sustain vital organ failure and die, sometimes even after being rushed to hospital, Gaudreau said. "For children that's particularly problematic because their bodies simply do not have the capacity to cool themselves and their core body temperature rises three to five times faster than that of adult," she said. "Plus they're in a confined space and they're typically not able to get themselves out of that situation by opening a car door or otherwise calling for help." Gaudreau also cautions parents not to leave unlocked vehicles outside their homes, saying children may wander into them and end up getting stuck inside without anyone knowing. Experts warned, however, against jumping to conclusions in assigning blame. "The vast majority of these cases we see, it's not a failure of love, it's a failure of memory," said John McKiggan, an injury lawyer in Halifax who founded Kids and Cars Canada, which offers advice and documents the dangers children face in and around vehicles. "It's not because the parent, caregiver, or grandparent doesn't care about the child. It's because something happened that made them forget and people don't understand how easy it is for that to happen." Reasons for those lapses in memory could include being tired, stressed, distracted, or experiencing a break in a daily routine which can lead to caregivers going into "autopilot," a scenario that could result in forgetting a child in a car. Parenting experts offer a number of tips to guard against such situations, including keeping a toy on the front seat while a child is in the back seat as a visual reminder that a kid is in the car, or placing a purse or cellphone in the back seat beside the child so the driver is forced to turn around before leaving. In cases where memory lapses have lead to deaths, however, one expert in trauma and grief advised against thinking that such tragedies only happen to other people. "We distance ourselves from that situation and say 'they're careless, they're indifferent to the safety of their kids'...If you just quickly distance yourself from that reality...then you're not going to learn the lesson," said Dr. Stephen Fleming, a psychology professor at York University. Fleming suggested offering simple warmth and support to families experiencing a loss like the Huyskens'. "This was a thoughtless act, not necessarily a thoughtless person...we're all capable of thoughtless acts." Boy, 2, dies after being left in car in Milton, Ont.